Copyright � 2000-2011, Lynn Conway. One of the things you'll immediately notice at the tracks is that there is a wonderful comraderie surrounding the sport of notocross racing, both among the riders themselves and also among family and friends who come along. This is indeed a family sport, with kids of all ages involved in the racing, and with many wives, family members and girlfriends and coming along to hang out with the riders. Over time, we'll try to capture some of that scene by putting more photos in here of the tracks, stands, pits, and of the various MRA personalities too. One great advantage of racing on motocross tracks compared to going trail riding is that there is always an ambulance and medics standing by, ready to provide assistance in case of injuries, major or minor. And it isn't uncommon for the ambulance to have to make a run to the hospital during and evening of race events. In addition, instant calls can be make for helicopter evacuation in the rare event of extremely serious injuries. As anyone who rides dirt-bikes knows, accidents and injuries do happen. It's part of any adventure sport, especially a "contact sport" like dirt riding. It turns out that in motocross racing it is injuries that are usually the main thing restrain your progress. The calculation is simple: If you try to push it too fast for your skill level, you'll pay the price in setback time waiting for an injury to heal. Thus raw courage isn't enough to help you "go fast". Instead you've got to practice and practice and develop real skills at each step of the way. There's plenty of courage out there, but the hard thing to do sometimes is to control your courage and not take risks that are too far outside the envelope of your current skills. The challenge is how to push the skill envelope a step at a time so that you can ride ever faster, but without pushing it too fast and having too frequent injuries. This approach to the risk-management of aggressive achievement of racing skills, but without "going to far too fast", enables riders at all skill levels to continually challenge themselves to push the envelope of their own skill. It also enables many young riders to rapidly go on to amazingly high levels of skill, as you'll see if you come out to Milan or Delta and watch the top riders go by. You'll be astonished at what you are seeing when the expert class riders rip by the stands and fly over the big jumps. 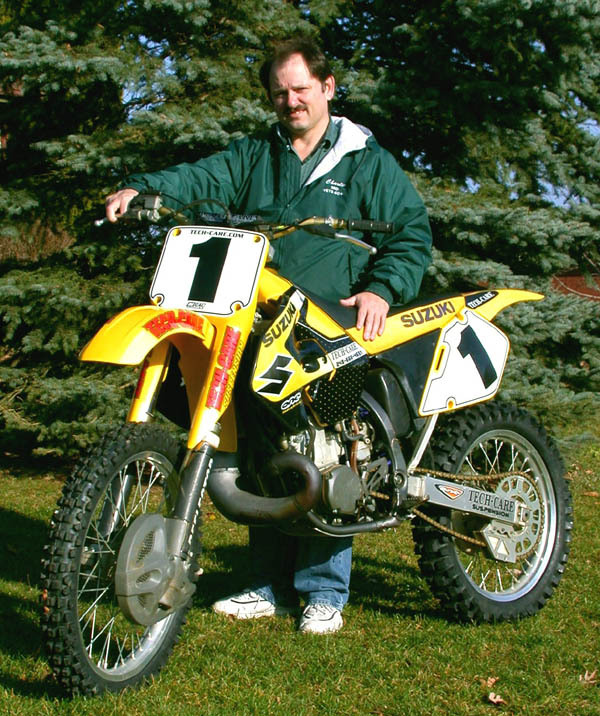 Alan (#343), 1st place 85cc expert for the '98 season. But why isn't bob suited up for racing ? Both Bob and Lynn are on MRA's "walking wounded list"
at the end of the '98 season. 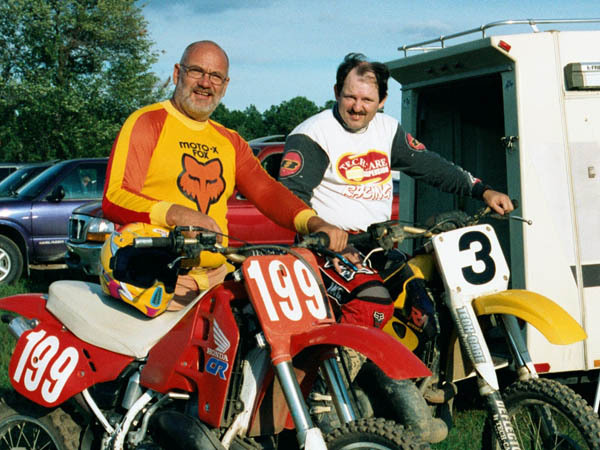 Every motocross race consists of two separate "motos", each of them being a four to six lap race lasting about 15 or 20 minutes. Each racer's final position is calculated by combing their results for the two motos. The top finishers get trophies or cash-back awards (at their option), depending upon their finish position. In the larger race classes, such as the beginner classes, trophies are handed out fairly deeply into the finish positions, so that many riders have a chance to get trophies. Each racer also gets "points" for their finishes in these races (25 points for a 1st place win, 22 for 2nd, 20 for 3rd, 18 for 4th, 16 for 5th, and then on down by one point for each lower position). These points are added-up over the entire race season to determine the racer's standing in the "Season Championships" in their race class (counting up to a maximum of your best 25 race finishes). The competition for Season Championship standings can get fairly intense in many classes. The racers in each class know each other well, and it gets to be a point of honor among them to try to outdo each other in the point. You'll often see riders looking at the posted "race standings" printout before races begin, as they check out their rankings in the standings, and those of their closest competitor. This competition for points often leads to intense competition among racers at all standings in each skill class, and helps keep the racing exciting as the season goes on - with just as strong competition among racers in the middle of the pack as among those at the front. Every racer who accumulates over 200 points receives a "Points Jacket" at the annual MRA racing awards banquet each spring. The racer's name, class and finish position are embroidered on their jacket, and these become prized mementos for many racers - reminding them years later of the adventure, excitement and comraderie of motocross racing - and of the many friends and comrades who shared in the competition and adventure with them. Here's a photo of the Vets 40+ class Season Championship Awards winners taken at the MRA Awards Banquet. 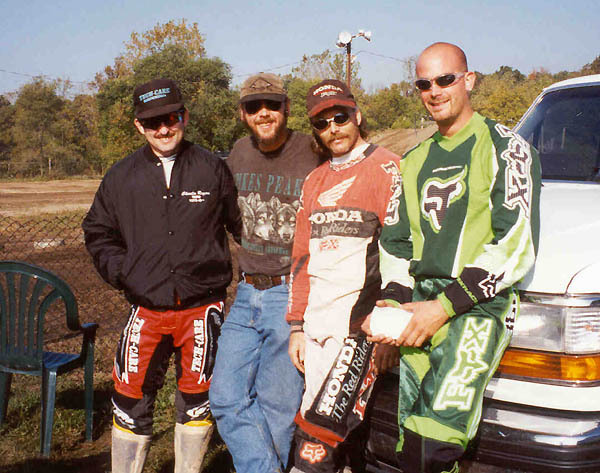 The banquet was held on March 31, 2000 in the "Main Event" club at the Pontiac Silverdome, the eve before the Professional Supercross races there. All these folks accumulated over 200 points during '99 racing. 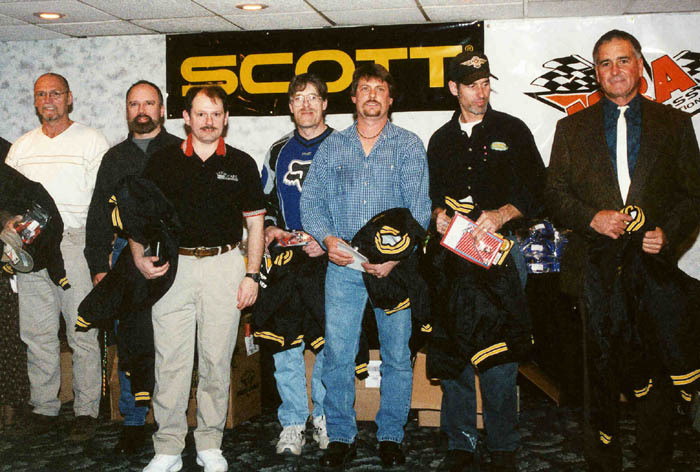 Left to right we see Rick Baldwin (2nd), Jeff Gundy (6th), Charlie (4th), John Koraleski (7th), Bill Moulton (3rd), Jeffery Clark (5th), and Barry Mayo (1st); not present were Paul Wheeler (8th) and Jeff Weber (9th). 1999 MRA Season Notes: Charlie had another good year at MRA, taking 4th place overall in the Championship Points for the 40+ class this year. However, Lynn's right hand didn't recover well enough from last season's injury for her to race this year. She has limited flexibility in the injured right thumb area, and also contracted arthritis in that area. By the end of the '99 season Lynn was able to do a bit of playriding on her 125 on our property. 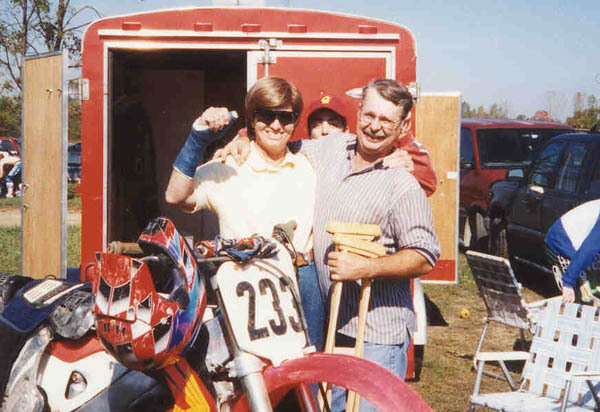 However, Lynn's hand never recovered well-enough for her to continue competitive MX racing, so she now enjoys her dirt bikes by occasional trail riding with Charlie. 2000 MRA Season Notes: Charlie had another fun year at MRA. He took 3th place overall in the Championship Points for the 40+ class this year. 2001 MRA Season Notes: Charlie had a great season at MRA this year. He just joined the Vets 45+ class this year, and his riding was much improved over last year. 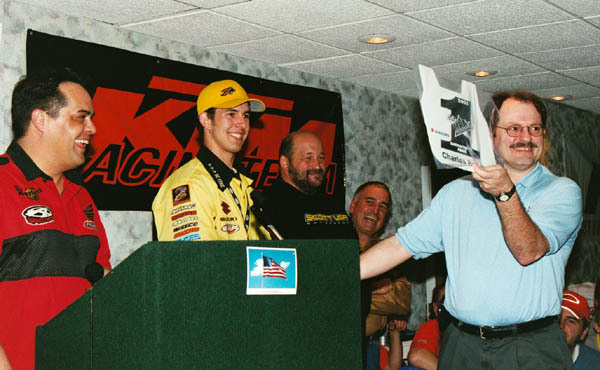 He finished the season in first place in Championship points in Vets 45+, so he'll ride with a #1 plate in the 2002 Season. 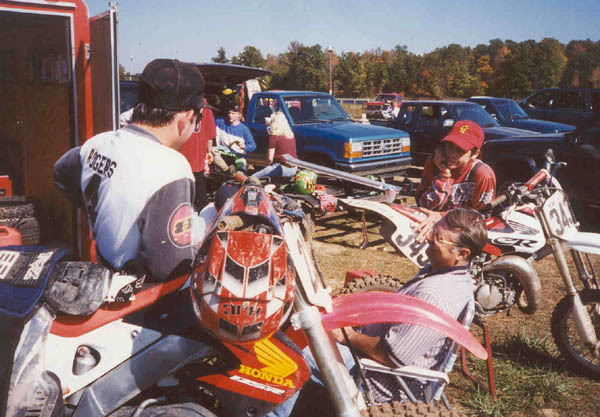 2002 MRA Season Notes: This summer Charlie got off to a late start in MX, and we also took more time to travel and vacation, so Charlie cut back on his racing. He did enough to have fun and to get his season points jacket, but not enough to get high into the season standings (6th in 45+). 2003 MRA Season Notes: Charlie had a good racing season this year. He finished the season in 2nd place in Championship points in Vets 45+. 2004 MRA Season Notes: Charlie had another great season of racing, finishing in 2nd place in Vets 45+ again, so he'll ride with a #2 plate again in the 2005 Season. 2005 MRA Season Notes: This season Charlie got off to a late start, due to hernia surgery in June. He still managed to finish in 3rd place in Vets 45+. 2006 MRA Season Notes: Charlie moved up to the Vets 50+ this year and had a great season. He put in his best lap times since he started racing, and finished in 2nd place in his class. He also now has the longest-running continuous streak of Championship seasons among active MRA racers.